Hey, did you guys hear Carrara 8.5 will launch on August 26th, 2013? Of course you did because the announcement was made on Carrara Cafe this weekend. The rumors are true though, Carrara 8.5 will launch on the 26th of this month. Automatic Morph Projection quickly gives you the fit you need for your figure's shape. Automatic Weight Map Projection allows AutoFit clothing to bend and pose smoothly with the figure. Morphs built into clothing are carried through the AutoFit process. Sample – Creates a key at every frame of the animation. Reduce – Programatically determine which keys are unecessary and eliminate them. Scale, and translate key frames along the Graph Editor. Marquee selection of key frames for Graph Editor. Carrara can now access the CMS database. File view provides selection based filtering so that the user only sees items compatible with the current instance tray selection. Double click and drag and drop loading are both supported in Smart Content Tab. Provides users with powerful tools to reset a pose, shape or both. Memorize and Restore allow user to take a snap shot of the model's current pose and/or shape and restore all or part of it. No more relying on built in clothing morphs to fit clothing over a figure. Carrara automatically projects any morphs for a TriAx figure onto items conformed to the figure. Spotlight, Sunlight, Moonlight, Tube Lights and Shape lights have all received a makeover and can easily be identified in the viewport. I'm not allowed to announce the price yet, but I can say that all of the new features have been documented. It's been so long... I don't remember what would qualify a buyer of C8 to a free upgrade. That's really good news! Will that be released at the same time, or is there a way to preview it? Here's to that wonderful software development team who have been toiling over this for so long! And Thank you for putting so much heart and soul into it! ...and the reflexive eyeroll almost knocked me out cold. We haven't released a price. I can't say for a certainty, but I don't think there will be any free upgrades to C8.5. That isn't an official statement or answer in any way though. Right now everything is in the Docs center in a private section. It is currently under review by the SW Devs and a DAZ_Spooky. Nothing in the docs is final yet. I don't have the ability to move the docs from public to private, but I'll see if I can't get a sneak peak posted here in the next day or two. So Carrara 8.5Pro Beta no longer works? Do I have to reinstall Carrara 8 Pro? Will files created in Carrara 8.5 beta work in Carrara 8 Pro? hope it works and isn't as slow as a dead snail! thanks Daz_Jared, appreciate the time and effort you have all put in ! and thanks for doing docs!!!! I had to work with the Smart Content Tab quite a bit when I was documenting it. It ran fine for me. There was maybe a 2-3 second lag between when I made a selection and when the files view filtered it. Everything else was pretty snappy. I am running a fairly decent machine at work, but by no means top of the line. Well I love being king for a day. I'll try to post more tomorrow. DAZ_ann0314 was kind enough to let me borrow server space to host the document. "a DAZ_Spooky" - what, there's more than one?!! Just had a quick look at the Cafe - they said a 50% discount for 2 weeks but no price. I would hope that perhaps this is 50% off the normal upgrade price and not the full price as the feature list doesn't justify more than 30-50USD for me. Guess I'll be sticking to 8.1 as it mostly does what I want anyway. This is unfortunate. I understand that most of the changes are for DAZ/Genesis, but some of them fix serious bugs in 8.1, that I posted to the bug system years ago and provided examples so they could be fixed. Unfortunately none of the fixes got inot 8.1, only 8.5. At least one of these bugs makes 8.1 unusable to me for what I do with it, so I will be forced to upgrade even though I don't use DAZ studio or Genesis. Thanks for all the work you guys have put into getting this release out, Daz_jared - a manual on the new features will be most welcome. Quick question, but very important to me making my purchase decision - do Optitex dynamic clothing sims transfer over to C8.5 reliably and have the bones been fixed so that they are solid as in Studio and not those awful Carrara dotted lines? I'm assuming you want to transfer the simulation from Studio? I don't think that there was anything changed from the previous workflow. You essentially have to freeze the simulation and bring it over into Carrara, there isn't native support for DAZ Studio dynamic clothing in the new version of Carrara. 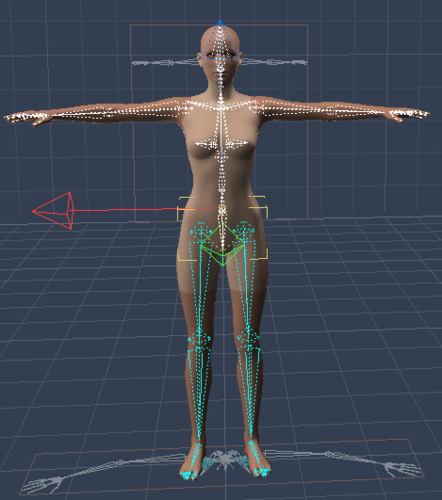 Attached is a screen shot of how the rigging displays for Genesis 2 Female in Carrara. At least one of these bugs makes 8.1 unusable to me for what I do with it, so I will be forced to upgrade even though I don't use DAZ studio or Genesis. That's my problem, too. In my case it is the object importing. There seems to be an issue in the 8.1 version that is fixed in the 8.5 version. I recently purchased Carrara 8.1, I am hopping the price will be bearable for recent purchasers of Carrara to upgrade. It sounds like 8.5 will let me use any of my clothing on any of my charactes and it will automatically fit right with no poke through and no endless fiddling with parameters. That sounds too good to be true, honestly, but if so, that alone would be enough to entice me as long as the price is reasonable. I know it doesn't work that way in the beta version of 8.5 I'm running now, but it's an older beta (I stopped trying the betas when back when daz redesigned the forums and I couldn't even log in for several months, because I never could figure out where to find the downloads for the betas in the new system. I've also remained a platinum club member out of sheer laziness as with the new system I have bought almost no other daz products since then). Even thought development cycle has been extremely long, it doesn't feel like they've actually *done* much, so it's hard to justify any kind of big expense to upgrade, even though I want to keep current. Clothing will work similar to how it works in Studio. There is backward compatibility, but not forward compatibility. You won't be able to autofit genesis clothing to a Gen 4 figure, but the reverse is true. Auto-fit relies on clones, so as long as the figure you are trying to fit the clothing to has a clone for the figure the clothing was originally designed for the clothing can be autofit. Genesis and Genesis 2 Female both come with default clones, and more can be purchased in the DAZ store. Carrara 8.5 supports morph projection for DSON figures, but not legacy figures. This means that if you morph genesis or genesis 2 female that morph will be projected on to the clothing. I can't guarantee it will work perfectly, but it will be better than the alternative. Auto-fit relies on clones, so as long as the figure you are trying to fit the clothing to has a clone for the figure the clothing was originally designed for the clothing can be autofit. Genesis and Genesis 2 Female both come with default clones, and more can be purchased in the DAZ store. Are there any plans for a clone of The DAZ Cow, so we can Autofit Skankwear to her? I didn't go out and test this - it's just something that I've been enjoying of late. Of course, but only once the new improved DAZ Cow 2 is ready. Such perfection can't be rushed.